This has to be the funnest fruit pizza ever! And the most colorful! 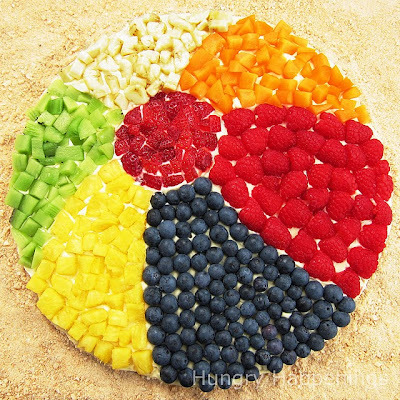 This beach ball fruit pizza was created by Beth from Hungry Happenings. Perfect for a beach themed party or a snack for your next pool get together. Check out her recipe for this fun fruit pizza (including the easy to make lemon cheesecake mousse) HERE. How fun is that! Great for a pool party! Isn't it so pretty! You could totally make miniature versions with regular size sugar cookies too!